The Royal Institute of Painters in Water Colours (RI) has been showing the best in contemporary watercolour painting since 1831. Along with works by elected members, the annual exhibition contains works by new, young and innovative artists selected from open submission, showing the full breadth of today’s diverse uses of water-soluble media. A number of prizes are awarded to artists in the exhibition, including the £1,000 Leathersellers' Prize, specifically to encourage younger artists taking up watercolours. This exhibition will be an ideal opportunity to purchase a work of art by some of the finest watercolourists working today. Want to receive an invitation to the Private View, unlimited free entry to the exhibition for you and a guest with a complimentary catalogue, plus more? 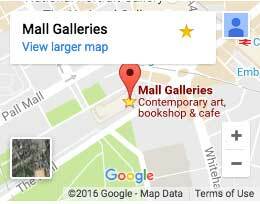 Find out about becoming a Friend of Mall Galleries. Roger Dellar RI will be painting in the gallery.